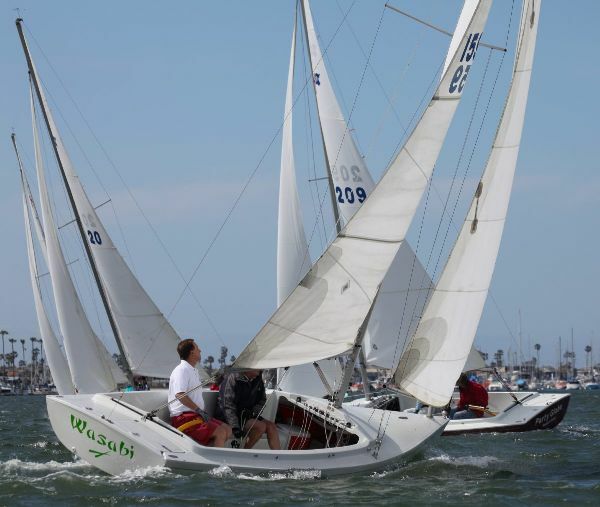 Alexander Vucelic, the new owner of W. D. Schock Corp., sailing a Harbor 20 in the 2010 Newport Harbor Yacht Club W. D. Schock Memorial Regatta. Tom and Jane Schock are pleased to announce the closing of the sale of the W. D. Schock Corp. (WDS) to Alexander Vucelic von Raduboj. Alexander will take over as President of WDS and be responsible for day-to- day operations. Tom Schock will remain on the WDS Board of Directors and continue to connect with sailors in the new role of Brand Ambassador. Jane Schock will also continue with the company helping to smooth the transition. Tom and Jane have taken a first, but small step towards full retirement. The Company experienced robust growth in 2010 and has a solid order book for 2011. Sailors throughout North America continue to order the much sought after Harbor line of sailboats ranging in size from 14 to 30 feet. These quintessential daysailers feature self-tacking jibs, large, comfortable cockpits, and classic good looks. As a child growing up in Southern California, Alexander's first sailboat was a Schock- built Naples Sabot. It was hull No. 6924 with a bright yellow hull. Alexander has been an active club racer ever since. Alexander's daughter sailed on the Columbia University sailing team. His 10 year old son has been wind surfing for three summers and started racing Prams last summer. Alexander has more than 20 years of experience in the world of capital goods manufacturing and served as Chief Operating Officer at Electric Machinery of Minneapolis, Minnesota. It was a family-held business, very much like W. D. Schock Corp., and specialized in the manufacture of 5-80MW Utility grade electric motors and generators. Electric Machinery's motors and generators are located on every continent, with approximately 30% of EM's output exported. Alexander graduated from the Georgetown School of Foreign Service where he rowed lightweight crew all four years. He earned his M.Arch at UCLA and his MBA at Columbia University. He is a California licensed Architect and a Private Pilot. Alexander commented "While at Architecture School a couple of my classmates and I dabbled in sailboat design. Little did I realize that nearly 30 years later, I'd be taking the helm at W. D. Schock. This is both an honor and a pleasure. The Company has a rich tradition of building boats which represent the best that life has to offer - family, friends, and fun. What W. D. "Bill" Schock started back in 1958 with the Lido 14 lives on, with Steve Schock's designs for the Harbor line continuing that tradition. The Harbor line boats are a delight to sail and perfect for an outing with friends or family. The quality and attention to detail in these boats result in what I like to think of as connoisseur's boats, the pleasure of owning them increases over time. I will work hard to support the Schock sailors, dealers, and fleets." Tom elaborated: "Alexander and I have worked closely together for the last 18 months on this transaction. He has become an involved team member in and around the shop leading up to the official 'change of watch' and has watched closely as the new Harbor 30 tooling has come to life. Alexander respects and appreciates the legacy of W. D. Schock Corp.; and he understands the unique aspects of multi-generational family businesses, having himself grown up in a family business which spanned five generations. Jane and I will continue to be involved with the company. Dealers should see more of me in my new Brand Ambassador role, helping to support their efforts. Sailors should also see me more often out on the water." W. D. Schock Corp. was founded in 1946 in Newport Beach, California, by Tom's father, W. D. "Bill." The company has built more than 13,000 boats in its sixty-five year history. The boats have ranged in size from the ever popular 8-foot Naples Sabot to the stunning Schock 55. The company is responsible for many innovations in the industry. In 1965 Schock introduced a Penguin that was the first production vacuum-bagged fiberglass and Unicore sandwich sailboat. Schock has built racers and cruisers, monohulls and catamarans; and in 2001 Tom collaborated with Dyna Yachts to introduce the canting ballast twin foil (CBTF) Schock 40. Boats currently in productionare the Sabot, Lehman 12, Lido 14, Santana 20, Santana 22, Wavelength 24, Schock 35, Schock 40, and the popular line of Harbor daysailors. The Harbor line includes the Harbor 14, Harbor 20, and Harbor 25. A brand new Harbor 30 will be launched this spring. At this important turning point, Tom and Jane are excited to see Alexander launch a new era of leadership, continuing the company's long tradition of designing and building sailboats for the best part of life.